What do you do when you’re in the on-deck circle? Any of the following? The first five options are somewhat helpful, but only part of what you can be doing in preparation for your upcoming at bat. First and foremost, you should be aware of the game situation — at the very least, know how many outs there are, the score, and the runners on base. Also, if one of the baserunners heads for home, you must be ready to clear the basepath of the bat and to give the runner proper direction (slide, stand, go around, etc.). But you already knew that, right? While you’re lugging around two bats with donuts and spitting sunflower seeds, you can also be watching the pitcher. And the catcher. And the infielders and outfielders. Check where the fielders are playing; for example, is the third baseman playing back? Are the middle infielders cheating toward second for a double play? See what they’re doing before you get up, and what they do when you get up. Their positioning may affect what you try to do during the at-bat, and when/if you become a baserunner. You can also take a look at the catcher — how he’s positioning himself behind the plate, and where he’s catching the ball. Is he in the same spot all the time, or moving around back there? Will you be able to see him move toward his proposed target, out of the corner of your eye, while you’re up at the plate? And is the pitcher hitting his spots, or is the catcher doing a lot of reaching for balls? This information could indicate whether the pitcher is tiring, or having trouble with his command (remember, most pitchers will fall back on the fastball when they can’t find the strike zone). And while you’re watching the catcher, take note of the umpire’s calls. Does he have a “high” strike zone or a “low” one? Is he giving the pitcher the corners? Has the strike zone expanded, or reduced, since the beginning of the game? How he’s calling at this point in the game is important if the count goes to two strikes against you. Finally, observe the pitcher. No, actually, study him. Watch his face, his hands, his unique tics / movements. Does he do something different when a curveball is coming, as opposed to a fastball? Maybe he slows down, or throws different pitches at different arm angles. He might squint, or dig his fingers into the glove, or touch his hat, or otherwise unconsciously “telegraph” his pitches. Also watch his body language and facial expressions. Is he looking confident, weary, confused? Is he allowing emotions affect his performance? Can you use this against him? How is he following through? Is he wildly off to one side, leaving the other open for an easy bunt hit? What kind of pitches is he throwing? Is he relying solely on breaking stuff, hard stuff, or mixing it up? Does he fall into patterns? For example, has he started everyone off with a fastball? Is he high or low in the zone? Can you tell if his pitches are breaking horizontally or vertically? After or while gathering all this extraneous data, you will want to get in your batting stance, preferably in the same angle you will be when at the plate. Some parks (and umpires) allow you to take your practice swings directly behind the backstop — if so, by all means take advantage. Otherwise, get into your stance, as close to the batter’s box as possible, with a good view of the pitcher. As he goes into his windup, find a comfortable spot of his upper body to focus on, then look for his arm slot — which will eventually lead to his release point. Try to develop a synchronicity between his rhythm and yours. This is the time to get your timing down: when he goes back, you go back. 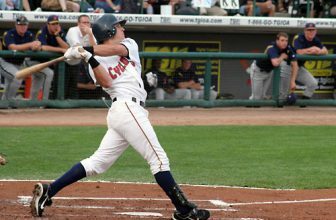 Though you are in the on-deck circle, you want to visualize being in the batter’s box, and emulate an actual at-bat as closely as possible. 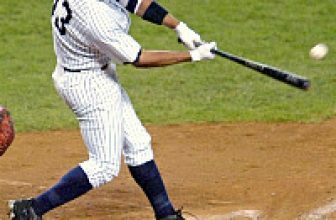 Start with your stance, and as he moves, you make the same movements you would as if you were already at-bat, all the way to the stride and the swing. This will help you “time” his pitches, and give you the best possible preparation before you dig into the box. Any more ideas on what you can do to prepare for an at-bat while waiting in the on-deck circle? Please share them with us in the comments below.